When working in an awkward or confined space, it can be tricky to ensure safe work. This highlights the importance of robotic hydrodemolition, and why remote control work is such a good solution. By working with hydrodemolition robots, we can remove the human operative from the work and makes the process much safer. 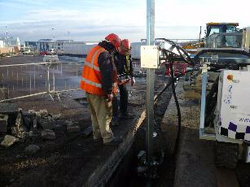 We utilise the latest robotic hydrodemolition equipment in order to carry out efficient, yet safe work. The Radio Remote Control is fully approved by EMC and adheres to all safety guidelines. It gives great versatility as it can be used wirelessly, or alternatively, can be used with the included cable. It includes modern safety features. 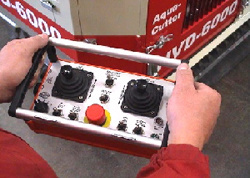 This system is operated from a harness, which is ergonomically designed to provide maximum comfort for the operator. Operating the robot using remote control equipment. The operator wearing yellow hi-viz is in control of the robot. The other operator is controlling a hard wired pump on/off and deadman. Now let’s see how the work can be done safely in a small space. 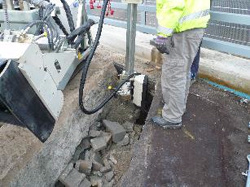 The work will involve breaking out unwanted areas of concrete using a remotely controlled robot. 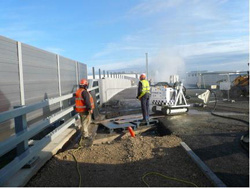 Operators working safely in a narrow area using robotic equipment. Careful preparation is extremely important in this job. Here the operatives are setting up the robot in the right position so it can do its job as safely as possible. 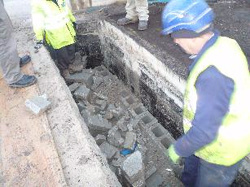 Here we see operators carefully and accurately placing the cannon in the right position before hydrodemolition can commence in a narrow trench. This is the final result. 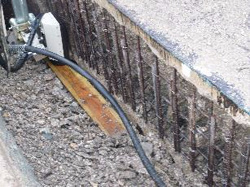 The underlying rebars have been exposed and all the work was done in a safe manner, even in this small and potentially difficult space. 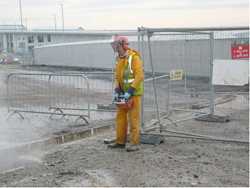 If you’re searching for a company who can offer safe working solutions for Hydrodemolition in confined areas, then make sure to get in touch with us. We’re confident that whatever your individual requirements, we can provide what you need.